Elective (planned) abdominal aortic aneurysm repair is a life saving procedure. This minimally invasive aneurysm treatment procedure allows an AAA to be repaired by sliding catheters into the aneurysm to release a new lining that pops open excluding the aneurysm from the circulation. The catheters are inserted through small incisions in the groin area, but no large abdominal incision is needed. 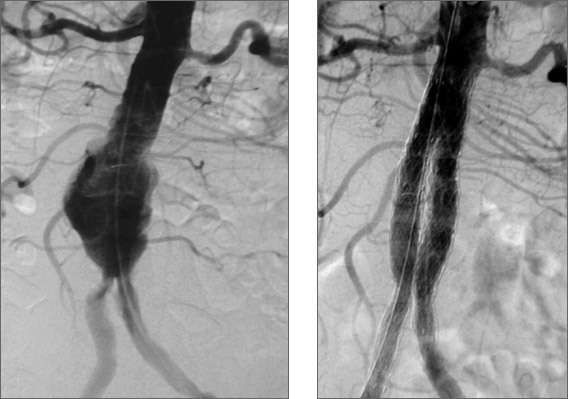 This endovascular (from inside the artery) stent graft repair has been compared to open surgery in several randomized trials. Endovascular stent graft repair may allow older, sicker patients to have safer AAA treatment and repair. Is stent graft repair effective? One study showed a five year freedom from death of 96% and freedom from rupture of 97%. Since this aneurysm treatment procedure is newer than open surgery, all patients are followed yearly with CT or other imaging evaluation. A complete discussion of all risks and benefits of endovascular aneurysm treatment and repair will occur during the consultation appointment. 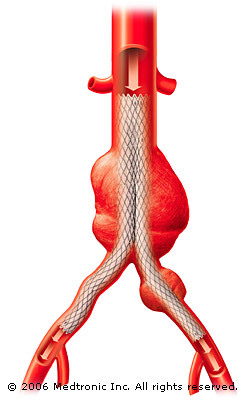 Not every patient with a significant AAA is a candidate for endovascular stent graft repair. When an aneurysm is large enough to warrant repair, the traditional method has been open abdominal surgery to relieve an aortic aneurysm. 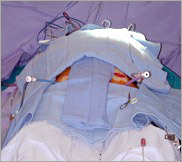 The abdomen is opened and the aneurysm sac is clamped and opened. 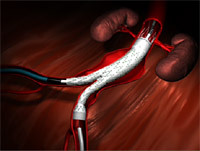 A fabric graft is used to replace the dilated portion of the artery. The abdomen is sewn up and the patient goes to the ICU for recovery. On average, patients spend one to two days in the ICU, 7-14 days in the hospital and have four to six weeks recovery time. The risk of death in the first 30 days after open surgery is 5-9% approximately. 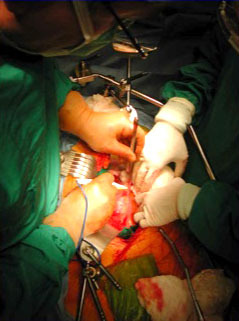 Many patients with AAA may be considered too “high-risk” for open surgery however, due to other associated medical conditions. Open surgery may be associated with up to a 25% risk of impotence due to arterial or nerve damage. The shape or extent of a particular aneurysm may dictate open surgery as the best option. For a consultation or second opinion, please contact us regarding aneurysm treatment options or call us at our office in Chicago, Illinois at (630) 856-7460. Traditional open surgery has been performed for over 40 years and has saved thousands of lives.